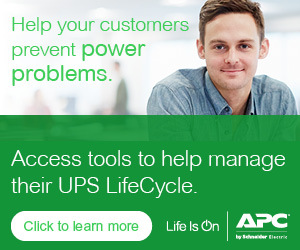 APC by Schneider Electric partners can earn discounts of up to 12% on an array of network UPSs, cabinets and enclosures, rack mount PDUs and extended warranties on deals with customers in the government, education and medical (GEM) markets under a recently launched incentive program. The program is an extension of a similar program launched about 2 years ago for the K-12 market. That proved quite successful in getting APC products into more schools, so we decided to extend it to higher education; federal, state and local government; and medical/healthcare customers. Deals below $15,000 (which is the threshold to qualify for deal registration) must go through one of our four (U.S. and Canadian) authorized IT distributors: D&H, Ingram Micro, Synnex and Tech Data. All such deals to customers in GEM markets get an up-front discount of 5%. You can also stack on top any channel-wide rebates we’re running on select SKUs. These change every quarter and are generally about 7%, for a total discount of 12%. Deals above $15,000 go through the usual registration process. If approved as a qualifying deal, you get a 7% deal registration discount plus an additional 3% for GEM customers, for a total of 10%. (Sorry, you can’t stack the quarterly discounts on top of that.) The message here is to make sure you’re part of our Channel Partner Program so you can get every discount possible. If you’re not sure whether a deal qualifies, just bring it to us and give it a shot. Even if it doesn’t get approved under the GEM program, we’ll do our best to find another meaningful discount. These are all hot markets, each with their own reasons for wanting or needing to refresh their IT infrastructure. The K-12 market, for example, is seeing a boom as technology is used in more and more classrooms for teaching and learning. The availability of E-rate funds certainly doesn’t hurt, either. There’s no shortage of opportunity out there. Now hopefully you’ll agree you’ve got some extra incentive to go after it. Click here to learn more and download our one-page flyer with all the details.